If there was one word to sum up the group at Lazzara, that word would be passion. The purpose of design for Lazzara is more than creating a fluid window line or a unique hull shape; it’s to create an emotion. One that connects the owner’s lifestyle through his yacht to the sea. Being a family builder has it advantages and ingenuity. It has propelled Lazzara Yachts to the forefront of modern boat building. The Lazzara family pioneered the fiberglass boating industry in the 1950’s with the Bounty II and securely planted its name in the marine world with the Gulfstar line of yachts in the 1970’s. 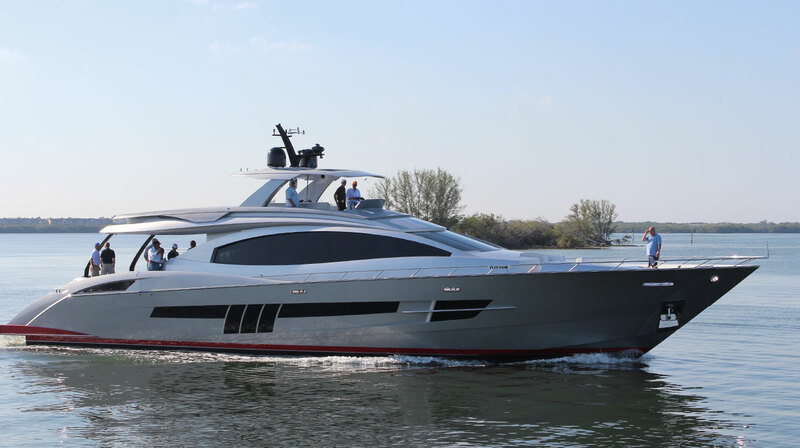 Today, Lazzara Yacht, based in Tampa, FL continues to lead the industry in innovation with its award winning yachts, revolutionary technologies and industry leading customer support programs. The Lazzara LSX line of yachts is driving the propulsion revolution with the introduction of pod drive systems into the yachting category. Buying a Lazzara: We offer used Lazzara Yachts for sale worldwide, including Lazzara Motor Yacht, Lazzara Motor Yacht, Lazzara LSX, Lazzara Skylounge models and more! Contact our sales professionals for immediate assistance. Selling Your Lazzara: With a team of experienced yacht brokers and marketing professionals, we will employ a comprehensive marketing approach to ensure your vessel receives maximum global exposure online as well as exposure in person at major boat shows. Learn more about how SYS Yacht Sales will help to sell your Lazzara yacht!